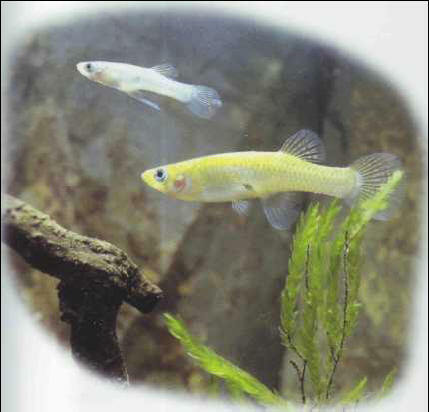 ft native of the southern United States, the spotted gambusia or mosquito fish has been widely introduced to tropical and temperate areas of the world. It is met in southern France, for instance, close to the Mediterranean coasts and even as far north as Bordeaux! These deliberate importations were designed to reduce plagues of mosquitoes, since the fry are voraciously fond of the aquatic larvae. In a sense, then, it is not a "true" aquarium fish, but it is very sturdy and spawns prolifically. You can raise it as live food for voracious predators like the Cichlids; or for those fish with a tendency to refuse artificial foods, like certain marine species, as it can survive a few minutes' immersion in salt water. Size: 5 cm.